The sign depicts the maximum occupancy for the Orlando City Council Chambers within the Orlando City Hall in Downtown Orlando, Florida. The building was located on the corner of South Street and Orange Avenue and acted as the place of governance for the growing Orlando area. The sign was created to maintain the fire safety codes which used the number of exits, as one of the fire protection features, to determine the maximum occupancy of a room. This was following the scramble for fire safety in 1956 when more than 713 calls were made concerning fires and costs overwhelming damaging the city’s wallet at an estimated overall cost of more than $300,000. City Council’s involvement with the firefighters in the city saw huge improvement in 1954 when the council approved a salary raise for the workers. Original sign: Orlando Remembered Exhibit, Orlando City Hall, Orlando, Florida. Original color digital image, 2016. Orlando Remembered Exhibit, Orlando City Hall, Orlando, Florida. Orlando City Hall Collection, Orlando Remembered Collection, Orlando Collection, Orange County Collection, RICHES of Central Florida. Copyright to this resource is held by Orange County Regional History Center and is provided here by RICHES of Central Florida for educational purposes only. "History: 1951 – 1975." City of Orlando. http://www.cityofOrlando.net/fire/history/. "Orlando, Florida - Code of Ordinances: Supplement 59 Update 2." MuniCode. https://www.municode.com/library/fl/Orlando/codes/code_of_ordinances?nodeId=13349. 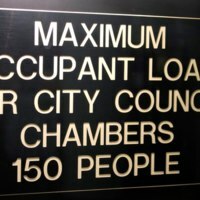 “Maximum Occupancy Sign at Orlando City Hall.” RICHES of Central Florida accessed April 23, 2019, https://richesmi.cah.ucf.edu/omeka/items/show/7888.